On Saturday, 20 October 2018 at 15:00 Riga Orthodox Chamber Choir "BLAGOVEST" and conductor Aleksandrs Brandavs invite to the concert “Peace Payer” in Riga Cathedral (Riga Dome Cathedral). The concert program will feature compositions by Georgs Pelēcis, Nikolai Golovanov, Alexander Arkhangelsky, Alexander Grechaninov, Alfred Schnittke, Palestrina, Ēriks Ešenvalds and others. The concert takes place within the framework of the International Riga A Cappella Festival, which from 17 to 21 October, already for the sixth year, offers high quality concerts of bright and internationally acclaimed performers of vocal music, promoting a cappella singing in Latvia. The choir “Blagovest” with its programs of sacred music has become regular participant of the Riga A Cappella Festival. Tickets for the concert are available at the sales points of “Biļešu serviss” /https://www.bilesuserviss.lv/lat/biletes/festivals/visi/miera-lugsana-265265/ and at the box office of Riga Cathedral. Riga Orthodox Chamber Choir "BLAGOVEST" and conductor Aleksandrs Brandavs invite to the annual concert of the Great Lent Chants in Riga Cathedral (Riga Dome Cathedral), on Sunday, March 11, 2018 at 18:00. With its annual concerts of the Great Lent (previously in the Concert Hall “Ave Sol” and this year in Riga Cathedral), one of the best performers of the sacred music - the Riga Orthodox Chamber Choir "BLAGOVEST" under the direction of Aleksandrs Brandavs is continuing the tradition of public performances of the Great Lent chants, established in the 19th century in St. Petersburg by the great Russian composer Alexey Lvov, giving the opportunity to the secular audience to hear these chants filled with deep emotions and blessed solemnity. Inviting to the concert, Aleksandrs Brandavs, Artistic Director and conductor of the choir, emphasizes: "The Great Lent chants are distinct in their philosophy and emotional saturation, which requires a particular filigree of performance. If the Christmas chants, sung just recently by our choir in the vaults of St. Peter's Church in Riga, are full of joy and festive mood and captivating the audience, then the Great Lent chants are penetrated with deep reflection, repentance, and depth of tragedy of crucifixion. At the same time, in every composition there is a combination of this tragedy and the upcoming joy of the resurrection, which many forget. Despite emotional drama, there is hope in every chant. Hope for everyone to atone for their sins and be forgiven." The program of the Great Lent concert, as every year, will commence with Artemy Vedel's “Pokayaniya otverzi mi dveri” (Open to Me the Doors of Repentance), a composition that is sung only during the Great Lent and that expresses the essence of all human emotions during the Great Lent. The audience will have the opportunity to hear again movements of the Liturgy of Saint John Chrysostom of Sergey Rachmaninov and - performed by "BLAGOVEST" for the first time - an Ode from the Arvo Pärt's "Kanon Pokayanen" (Canon of Repentance). The concert program will also feature compositions, both traditionally included in the choir’s repertoire and newly discovered, by Alexander Arkhangelsky, Alexander Grechaninov, Pavel Chesnokov, Nikolai Golovanov, Georgy Sviridov. The Riga Orthodox Chamber Choir "BLAGOVEST", already overgrown the boundaries of a chamber choir, is in its way a unique choir, which unites at a high level of professionalism the best traditions of Latvian choral singing and bright and thoughtful technique of performing orthodox music. Sacred music performed by the choir "BLAGOVEST" move and inspire listeners not only in Latvia, but all around the world. To the victories and high achievements at many international choral competitions and festivals, under the leadership of its founder and artistic director Aleksandrs Brandavs the choir added last year the title of Champion of the European Choir Games and the victories at the prestigious Grand Prix of Nations in Riga and Colombo, receiving high praise for conscientious and persistent work of the leader and singers of the choir during 28 years. Tickets for concert are available at the sales points of “Biļešu serviss” and at the box office of Riga Cathedral. Riga Orthodox Chamber Choir "BLAGOVEST" traditionally invites to a concert of Christmas chants on Sunday, January 7, 2018 at 18:00 at the St. Peter's Church in Riga. Led by the artistic director and conductor Aleksandrs Brandavs, the choir has prepared a new, not yet presented program of Russian sacred music: Christmas chants and concerts for the choir and soloists by Stepan Degtyarev, Nikolai Golovanov, Pavel Chesnokov and other composers. Some festive surprises will also be performed. The children's choir of the Riga Pupil’s Palace (Rīgas Skolēnu pils) "Accolada" will take part in the concert as a guest, under the direction of conductor Oksana Cherkasova. On Sunday, October 22, at 19:00, the Riga Orthodox Chamber Choir "Blagovest" and conductor Aleksandrs Brandavs invite everyone to the concert "In Thy Kingdom" in Riga Cathedral (Riga Dome Cathedral), concluding this year's Riga A Cappella Festival with the program of sacred music. The choir will present a diverse program, reflecting the rich creative experience of “Blagovest” for over 25 years, with the emotional fulfillment inherent to the choir and its maestro. Along with orthodox chants and compositions of beloved composers: Alexander Arkhangelsky, Alexander Grechaninov, Sergey Rachmaninov, Alfred Schnittke, and others, traditionally included in the choir's repertoire, “Blagovest” will also sing compositions of Da Palestrina, William Albright and Lucija Garuta, as well as the Psalm No.150, written by Georgs Pelēcis for the choir “Blagovest”, in the new arrangement by the author. The audience will also have the opportunity to hear the competition program that brought double victory to “Blagovest” at the European Choir Games and the Grand Prix of the Nations that took place this summer in Riga. The concert is organized with the support of the State Culture Capital Foundation and the Education, Culture and Sports Department of Riga City Council, in the frame of the 5th International Riga A Capella Festival. Tickets are available at the sales points of “Biļešu serviss” or at the box office of Riga Cathedral. After the concert, the choir will travel long distance to represent Latvia in the Grand Prix of Nations within the 4th Asia Pacific Choir Games in Colombo, Sri Lanka. With remarkable success and a double victory, the Riga Orthodox Chamber Choir BLAGOVEST has concluded participation in the Grand Prix of Nations 2017 and the 3rd European Choir Games, gaining the gold medals and titles of the Winner of the Grand Prix of Nations and the Champion of the European Choral Games in the competition category "Musica Sacra a cappella". 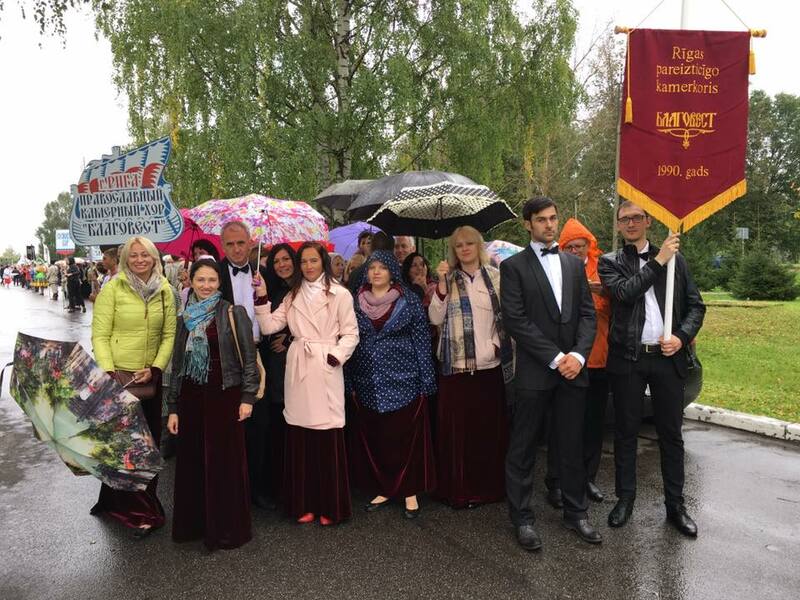 The choir, with its diverse, high-quality and emotionally heartfelt singing, has conquered both the hearts of the audience and the highest scores and recognition of the jury; and with great emotion BLAGOVEST sung the Latvian national anthem twice from the stage of the awards ceremony. "Our success is based on the team of our choir, our people, and their professional work," says Aleksandrs Brandavs, the founder and conductor of the choir BLAGOVEST. "But the main reason is – you need to love music as it is loved by our singers. That's why our audience loves us. And it is a great satisfaction that chants, filled with love and emotion, are gaining recognition and the highest praise from the professionals." With these great victories and feeling of a well-accomplished work, the choir closes the season. During the next season, the Riga Orthodox Chamber Choir BLAGOVEST will participate in the Riga A Cappella Festival that traditionally takes place in Riga in October, as well as will represent Latvia in the Grand Prix of Nations Colombo 2017, taking place in the frame of the 4th Asia Pacific Choir Games in Sri Lanka on October 21-28, 2017. On April 02, 2017, at 15:00, in the AVE SOL concert hall, the Riga Orthodox Chamber Choir BLAGOVEST will represent the annual concert “The Lenten Chants”. Over the course of time, certain choirs began to revive this tradition which was, naturally, interrupted during the post-revolutionary era. The Choir BLAGOVEST started to perform chants of the Lent in the 1990s. BLAGOVEST was representing its Lent program not only in the capital, but also in other cities of Latvia. In 2014, the Choir was performing the Lenten chants together with an outstanding baritone of the Latvian National Opera Samson Izyumov. While continuing to broaden the repertoire, on April 2, the Choir will represent new pieces of music which were not performed before, i.e. the compositions from the opus 37 “The Chants of the Lent, Holy Week and the Easter” by Russian composer N. Golovanov. BLAGOVEST first performed the compositions of N. Golovanov during the Christmas Orthodox Chants concert in January 2017, and the choir continues to get familiar with the impressive oeuvre of this composer. As well, the concert program includes the music compositions by Rachmaninov, Arkhangelsky, Vedel, Gretchaninov, Schnittke, Glagolev, Bortnyansky and Nikolaev-Strumsky. Two soloists will take part in the concert – the protodeacon of the Riga Holy Trinity Cathedral Vsevolod Melnikov (baritone), as well as Yury Tyutyunnikov (tenor). After the Lent concert, BLAGOVEST, at the invitation of the organizers, is going to Poland to the annual international festival Hajnówka’s Church Music Days. In this music event, BLAGOVEST will take part for the 5th time already. Within the Hajnówka’s Church Music Days in 2016, BLAGOVEST got awarded twice: with the diploma to the Choir for the 1st place in the Academic Choirs category, as well as with the personal award to the best conductor. Tickets to the Lent Chants concert are available at "Bilešu Paradīze" home page, as well as one hour before the event at the venue (the AVE SOL concert hall). On February 9, 2017 in the Riga Reformat Church, the BLAGOVEST choir gave a concert in honour of the new album “In Thy Kingdom”. This vinyl and CD album is a tribute to the choir’s 25th anniversary. The album was recorded in 2016 in the Riga Reformat Church, and contains sacred music by Russian composers. Photo report from the presentation can be viewed here. On February 9, 2017, the album “In Thy Kingdom” by Riga Orthodox Chamber Choir BLAGOVEST will be released. This upcoming vinyl and CD album is seventh in BLAGOVEST discography and is a tribute to the choir’s 25th anniversary. The album is comprised of a number of selected pieces of music from the choir’s repertoire covering a wide spectrum of orthodox sacred music compositions. Being leaded for 25 years by its founder and permanent artistic director Alexander Brandavs, the choir received recognition in various international festivals and music competitions, released 7 albums and gathered significant experience while touring to many countries with program of Russian sacred music. The touring geography of BLAGOVEST includes Belgium, France, Italy, USA, Denmark, Russia, Austria, Poland, Bulgaria, Lithuania, Belarus, Great Britain and Greece. BLAGOVEST continues to broaden its repertoire and familiarize the listeners with previously unknown pieces of music. For 2017, BLAGOVEST scheduled participation in a number of events in the world of sacred music. The presentation of the 7th album by BLAGOVEST will take place at 19:00 in the Riga Reformat Church at 10 Marstalu Street wherein, in summer 2016, the album was recorded. Riga Orthodox Chamber Choir BLAGOVEST conducted by Aleksandrs Brandavs will give its Christmas concert in Riga Church of Luther (Tornakalns Church) on January 8, 2017. The concert deserves a special attention since the choir will perform the masterpieces of famous composer, conductor, pianist and teacher N. S. Golovanov (1891-1953). Besides Golovanov’s music another newest music composition by Georgs Pelēcis will experience its premiere – Psalm 150. Traditional orthodox Christmas chants by Rachmaninov, Bortnyansky, Zinoviev and Diletsky are also a part of the concert programme. The tickets are available in “Biļešu serviss” ticket offices and online. The new 2016-2017 season started for BLAGOVEST quite actively – with September tour to the Old Ladoga to take part in the international festival of sacred music, at the invitation of the Leningrad autonomy Culture Committee. This festival was organized among other events in honor of the 900-year-jubilee of the Ladoga Fortress and the Old Ladoga Dormition Cathedral of the Holy Dormition Nunnery. In that large-scale event, various choirs participated – both church and secular musical bands without any restrictions concerning age or gender. Within a framework of the festival, the consolidated choir of several hundred singers had performed a number of pieces of music in the open air. The rainy weather could neither prevent the event, nor cast gloom over the participants’ joy. As well, the choirs-participants were representing individual programs. The founder and artistic director of «Blagovest» Aleksandr Brandavs emphasized the high level of choir culture in Latvia as well as good management level of the festival: «I use to come here with pleasure, since it is exciting, proper organization and kind people. And to be honest, I come for those eyes welcoming us here – they heat up my soul a long time after the event». This year, the Old Ladoga was accepting the guests not only from Saint Petersburg and the Leningrad autonomy, but also from Kaliningrad, Latvia, Donetsk and Estonia. In May 2016, BLAGOVEST attended the 35th International Festival “Hajnowka’s Orthodox Church Music Days”, which took place in Poland. The Festival happens every year since 1982 and receives various participants – professional, parochial and amateur mixed, male, and female choirs (including juniors). Among other choirs from Poland, Russia, Belarus, Georgia, Romania and Ukraine, BLAGOVEST represented its individual program, which was comprised of the pieces of music by G.Pelecis, A.Shnitke, A.Grechaninoff and other composers. BLAGOVEST took part in this Festival not for the first time: the professional experience of BLAGOVEST includes Hajnówka of 1994, 1998 and 2004. BLAGOVEST returned home from Poland with two awards: the diploma to the choir for the 1stplace in the category “Academic choirs”, as well as the personal award to BLAGOVEST’s founder and all-time director Aleksandrs Brandavs as the best conductor! These two awards took their stand in the range of other BLAGOVEST’s achievements. The 36th International Festival “Hajnowka’s Orthodox Church Music Days” will take place in Poland during May 8-13, 2017. Blagovest welcomes everyone to attend our traditional Easter concert on March 20, 15:00 in Riga - Ave Sol concert hall. Concert program: Russian sacred music masterpieces of A. Vedel, A. Lvov, P. Chesnokov, A. Shnittke and other composers. Solists: Mara Pilanta, Vsevolod Melnikov, Yuriy Tyiyinnikov. Conductor: Aleksandr Brandavs. Entry ticket - 3.00€. Tickets can be bought 1 hour prior to the concert. July 25, 19:00 at Ave Sol (Citadeles 7, Riga). Tickets: 1.50 EUR. July 28, 18:00 at St. Peter's Church (Skārņu 19, Riga).. Tickets: 3.00 EUR. Conductors: Aleksandrs Brandavs un Catherine Bolzinger. Blagovest welcomes everyone to attend our Easter concert on March 29, 15:00 in Riga - Ave Sol concert hall. The program: Russian sacred music masterpieces of A. Vedel, A. Lvov, P. Chesnokov, A. Shnittke and other composers. Solists: Mara Pilanta, Vsevolod Melnikov, Yuriy Tyiyinnikov. Conductor: Aleksandr Brandavs. Entry ticket - 3.00€. Tickets can be bought 1 hour before the concert.